It was very good to get another race night in despite the ever present chance of rain. Several riders still have championship competition to come and the opportunity for weekly racing was welcomed by all. Brandon Hutton continued on his merry way with another undefeated night out and looks set for a great state titles performance in the next week – we wish him all the best. Behind the Dozer, Luke again dominated the placings with Greg ‘531’ Reynolds and Kane Hodge also picking up some of the action. However it was the ladies who caught my eye with three great rides from Thomasz, Rayner and Holt. 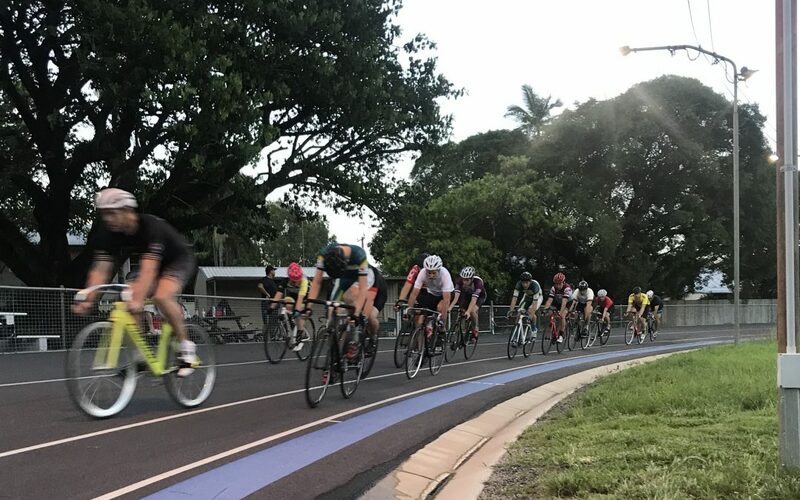 In the B Keirin we saw a tremendous sustained burst of speed from Gaby to take the win over Josh Rayner and Michael Keetman. This was hard fought effort with anyone of the three in contention, however the winner showed no signs of fading in what was the Keirin of the night. Nicole Holt bided her time beautifully in the last lap of her Keirin and finished the better of Jim Larcombe (coming off some good state titles form) and Alana. Nicole proved patience is a virtue in more ways than one with her recent tropical training paying off. Alana’s victory came in the C grade scratch and she showed in typical fashion that her calm and determined riding style pays dividends. B grade scratch win to Greg Hutton again showing that Tassie form is good anywhere. Senior handicap was a class act with Brandon ace-ing it in front of Reynolds and Rocket Rod. Again this year we see Brandon battling the middlemarkers in this event. Organisation and tactics remains the key to success and the riders that do it best invariably come out on top. In the juniors, state star and record holder Siena Goulding was the only rider to break the 40 second mark over the lap TT. Liam Scott finished with a PB just behind her and Rhianna McDonald continues to impress with consistent efforts. Incidentally Liam’s father Gavin is no slouch at track himself and Liam shows all the promise to follow in his father footsteps. Thomas and Jackson renewed their good natured rivalry in the junior B’s finishing in that order over the timed event. The all-in junior handicap was a treat with Elijah Williams coming up trumps, followed by Siena, Rhianna, Verety Liam and Thomas. These talented kids put on a worthy wheelrace, and I do believe Elijah has the ‘X’ factor in his cycling ability!